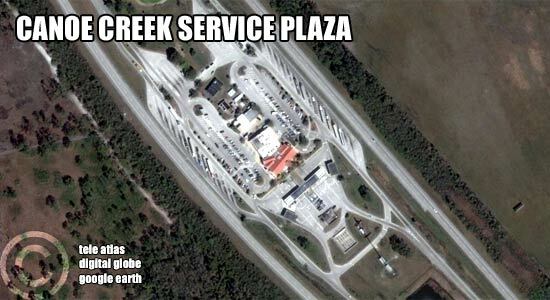 Older Google image of the Canoe Creek Service Plaza, as seen on TurnpikeInfo.com from 2009 through 2011. Florida’s Turnpike Enterprise continues with a multi-year construction project to renovate all service plazas across the turnpike, with the Canoe Creek Service Plaza becoming the latest addition to the list of plazas undergoing renovations. The Canoe Creek travel plaza is located at mile marker 229, just south of the Disney-Area exits in Osceola County. At this time, the gas station remains open, with some food in the convenience store. The only other food available at this time is from the Dunkin’ Donuts restaurant. The food court is undergoing a complete renovation that will not be completed for several months. Further north, in the heart of the Orlando Metro Area, the Turkey Lake Service Plaza construction continues unabated, with final work on the new food court underway. However, some limited food service is available. Nathan’s Hot Dogs recently reopened, and there is a new convenience store and gas station operating at the travel plaza, located at mile marker 263, between the I-4 and East-West Expressway exits. The upgrade to Florida Turnpike service plazas will cost about $162-million. It is expected traffic through the service plazas will be largely unaffected by the construction work. A clerk at the Canoe Creek Service Plaza told TurnpikeInfo.com Wednesday night, January 30, the traffic going through the plaza was moving, “pretty good,” and that no construction vehicles were blocking any access.